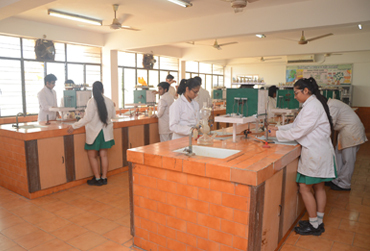 Chemistry lab is situated on the first floor of the school building. It comprises of main lab and a store room and a separate place for LPG connection which provides LPG gas for conducting chemistry practicals. The lab is very well lit and ventilated. The exhaust fans have also been provided in the lab. The lab also has a good drainage system. One of the walls of the main lab is lined with approachable cabinets which contains all the chemicals and the glass apparatus. The store room is also provided with cabinets, shelf tops and water connection. The work top provided to the students is wide and spacious. The open shelf is provided on top of the table along with water connection and gas connection. The open shelf is commonly used to keep chemicals in the reagent bottles. Cabinets are provided below the worktop table for keeping the apparatus used in the chemistry lab. One cabinet is provided to each student. The apparatus used in the lab are latest and of good quality. New edition to the vast apparatus agglomeration is the Seat-Student Environment Administration Teacher- Friendly micro scale chemistry laboratory kit. This apparatus requires the chemicals in minute quantity. The lab can cater to 20 students at a time. The different apparatus used in the lab are Kipps apparatus, physical balance, boiling tube, tripod stand, clamp stand, test tubes, conical flasks, etc. All the glass apparatus are of good quality to minimize the breakage. The chemicals are stored in the proper reagent bottles and are easily accessible to the students. The students are able to perform all the practicals required for CBSE prescribed syllabi. Fire extinguishers are installed for any emergency. Proper gas connection records are maintained.